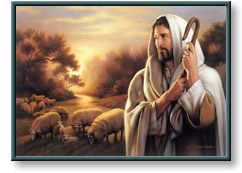 The Lord is My Shepherd depicts Christ as the Good Shepherd. He is forever committed to His own and no one can take them out from under His care. Framed Size:................... 24" x 28"
A 14" x 20" print comes deluxely framed in a wood frame with light brown mat. Framed Size:................... 32" x 40"
A 21.5" x 29" signed print comes deluxely framed in a wood frame. Image Size:........... 21 1/2" x 29"
This canvas is available in an ornate gold frame for an additional $140.00. Frame dimensions are 31" x 38". Image Size:....................... 25" x 35"
This canvas is available in an ornate gold frame for an additional $245.00. The Lord is My Shepherd copyright © 2001 by Simon Dewey is prohibited from being copied.